TaxiFareFinder offers various ways for you to integrate with our features. This page covers the plugins currently available. 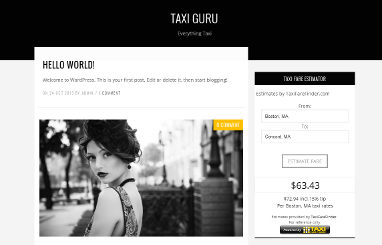 You can now offer the popular taxi fare calculator directly on your WordPress-based website. Download and install this plugin to place a TaxiFareFinder widget on your website. Choose from over 600 localities in taxi rates. "US Average" and "Canada Average" are also available. AutoComplete functionality for the address fields. Install TaxiFareFinder for WordPress either via the WordPress.org plugin repository or by uploading the /taxi-fare-calculator-by-taxifarefindercom/ directory and its files to your webserver (in the `/wp-content/plugins/` directory). If you are not already, go to WordPress administrator console. Activate the plugin, under Plugins -> Installed plugins. Enable the widget by dragging it into the Main Sidebar, under Appearance ->Widgets. Click on the up-side-triangle on the widget to set properties. Widget title Appears at the top of the widget. Visible to users. Widget message Appears at the top of the widget. Visible to users. TaxiFareFinder logo Appears at the bottom of the widget. Please support us by displaying this logo and linking to us! The entity handle determines which taxi fare calculator and taxi rate will be used by TaxiFareFinder. This is a required field. The entity handle is often associated with a city but can also be a region, school, airport, or taxi company. To look up the Entity Handle for your city, please refer to the following section, TaxiFareFinder Entity Handles. (This is currently not supported.) This enables a custom page at TaxiFareFinder that only lists your taxi company, logo, and/or its dispatch number. You must request and have this be generated by TaxiFareFinder. You can search for your Client ID in the following section, TaxiFareFinder Client IDs. If you do not have one, please inquire here. Specifying the API Key enables the widget to display the results within the widget. For your own API key, you must request it directly from TaxiFareFinder. For more information, please visit TaxiFareFinder Developers. Q. I do not see taxi fare estimates. A new window opens, but I only see the main TaxiFareFinder page. (i.e. http://www.taxifarefinder.com/index.php) Why? A. You most likely do not have the Entity Handle specified correctly. Please make sure to look up the proper code at TaxiFareFinder Plugins age. A. The information that are sent back are: a) "To", b) "From", c) entity handle, d) client ID (if specified), and e) API key (if specified). Q. Where can I find the links to the TaxiFareFinder logos? A. Please refer to TaxiFareFinder Links & Partners page. Q. What are the disclaimers? A. Please refer to TaxiFareFinder Disclaimers page. Coming soon! If you are already an advertiser, please contact us.